You have got to try out these gorgeous paper stars with your favorite color paper- big ones or tiny ones. 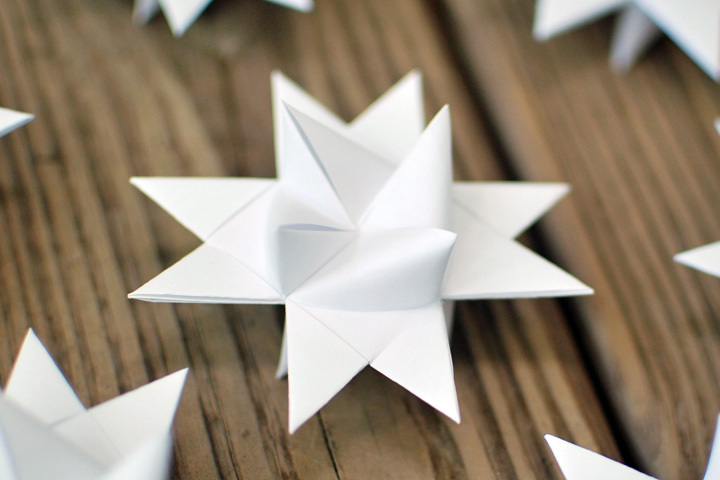 Our paper star tutorial makes it crazy easy! They are great for any occasion, but I made them in white to look like over-sized snowflakes recently and they looked just perfect strung from our tree and dangling above our table. 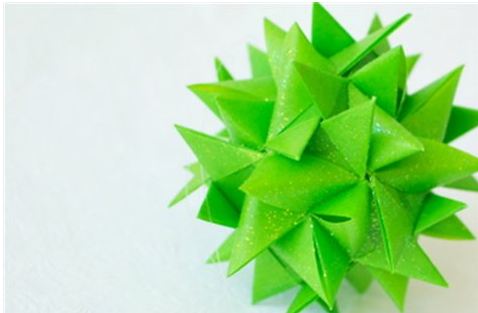 The paper star tutorial we’ve come up with is the step by step instructions for making these origami paper stars that will get you ready for Christmas, or any fun event you are hosting! Do you want a little more “starry” inspiration, then try this even easier way to create a gorgeous light display. Creating things out of colorful paper has become wildly popular and we love getting on board with the idea using our simple origami folds for a star or snowflake. You can also try making flowers, butterflies, owls, and pretty much any other critters you can dream up. If you want a little bit of Origami Trivia (c’mon you know you do!) check out these fun facts. A bit of cutting and folding is all you need to create these pretty stars with our paper star tutorial, then sprinkle a little glitter on each one for a festive holiday display. This would be a great activity to do with your girlfriends, while catching up on their latest holiday plans and party tips. If you want to get extra fancy, Amazon has some great paper to get you started that you can order here. 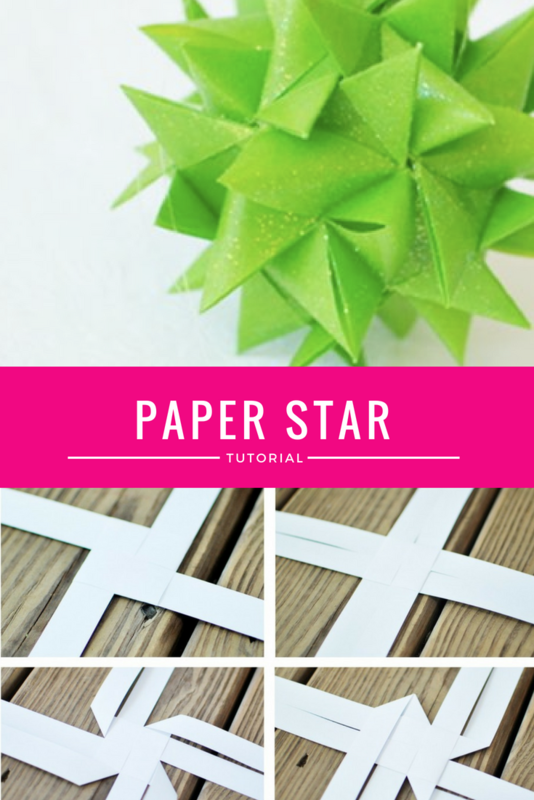 Their creator Lisa has been so sweet to share her tutorial for creating paper stars at home – so that you can make them for your own events. 1. 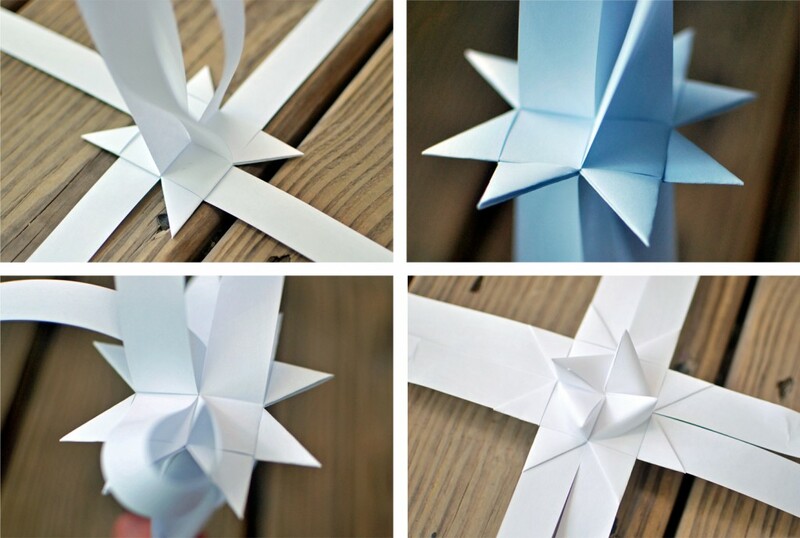 To make the origami paper star with our easy to follow tutorial; start by taking 4 strips of paper equal in length. 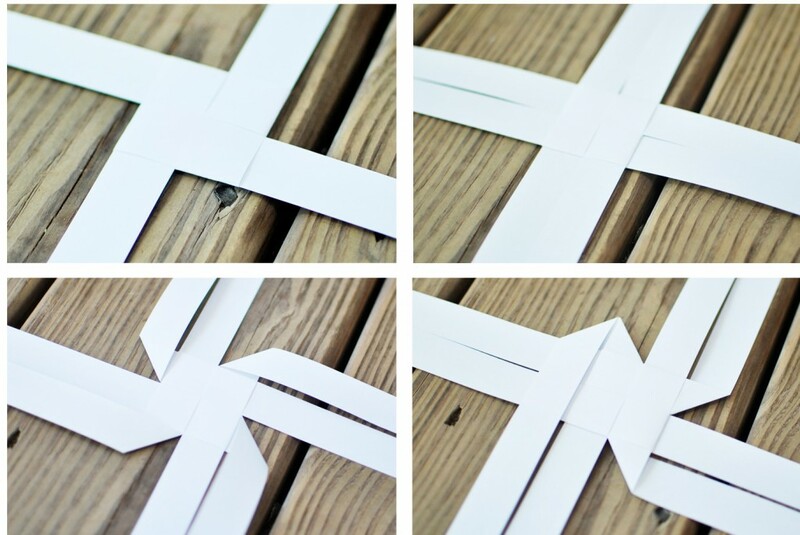 Fold each in half and weave centers together creating 4 double strips of ‘tails’. 2. Take 1 strip per ‘tail’ and fold across center weave. Tuck the 4th tail under the first one. 3. Fold 4 tails diagonally. 4. Flip star over; fold each diagonally folded tail downward. 5. Fold each downward folded tail onto itself creating a point. Tuck each point into the top layer of center weave. 6. Repeat Steps 4 and 5 to remaining 3 folded tails. 7. Repeat Steps 3, 4 and 5 to remaining 4 straight tails. 8. To create top and bottom points, fold each tail towards the right and tuck into the frontward tail. 9. When you have done this 8 times, your origami star will have 8 tails that will need to be trimmed. 10. 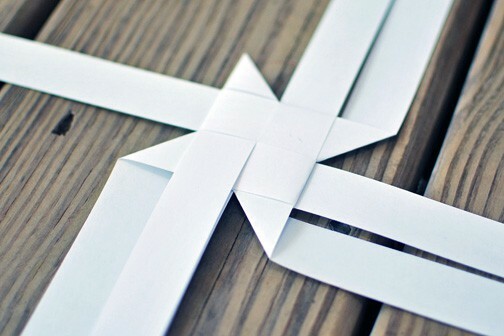 Trim each tail and your paper star tutorial is complete! We used a simple paper craft idea to create these shamrock origami fans for St. Patties Day and these fun milk carton lanterns. And folding paper in even an easier way creates a gorgeous light display. PS. Find more Christmas DIY crafts right here. these are so cool! Thanks for sharing the tutorial. LOVE these. Thanks so much for the tutorial. I tried making them before from ribbon and that was a disaster. Might try again in paper for Christmas. Thank you so much for sharing this. I made a bunch years ago from kits I got while visiting Denmark. But sadly I lost the instructions. I’m so glad you shared this because I’ve been wanting to make some more. I think these stars are beautiful! The only thing is I’m having trouble with getting the last 8 points to look right ( the ones on the top and bottom). I’m following your pictures but I just can’t seem to get them to slant like that! >.< Help please? I have been struggling to get the last 8 points as well, this tutorial seems to not give enough information. I have been working at it for a couple of hours. Just a word of thanks for this pattern. I have been looking for these stars to make for several years now. Thanks seems so trivial compared to how much they mean to me. Again Thanks! ! ! ! ! Maybe it’s too late for me to be working on this… but I gave it a go three times, and I just can’t seem to make it work. I keep getting stuck on step four and what the word “downward” neans. Thank you so much for the tutorial. When I was a young girl my German grandmother and I used to make these out of used Christmas wrap and dip them in parrafin and sprinkle with glitter when we were finished. We had such fun making them for the following year to hang on the tree. My grandmother is long gone now but would be happy to know this idea can be passed on to the next generation. I have looked for the instructions many times and am happy to have found them. where do you find the paper strips? It was too difficult…. i got stuck in step 4 — :( What does fold downward mean?? I wish there were more pix with every step.